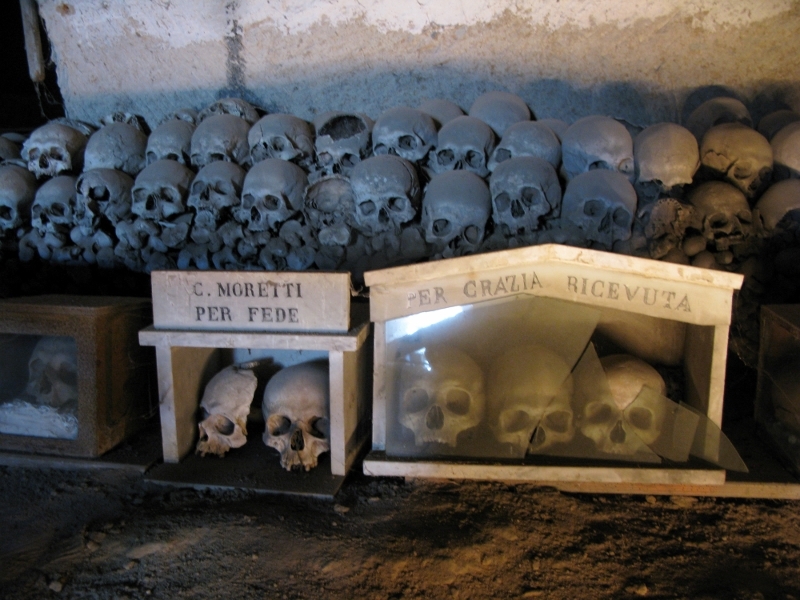 When last in Naples, I visited a massive charnel house and didn’t even know I was in one until I’d left. Back in the day, when cemetery space was in short supply, it was common practice to bury bodies for a few years to let them decompose and then dig them up and move their bones to a charnel house where they’d take up far less room. 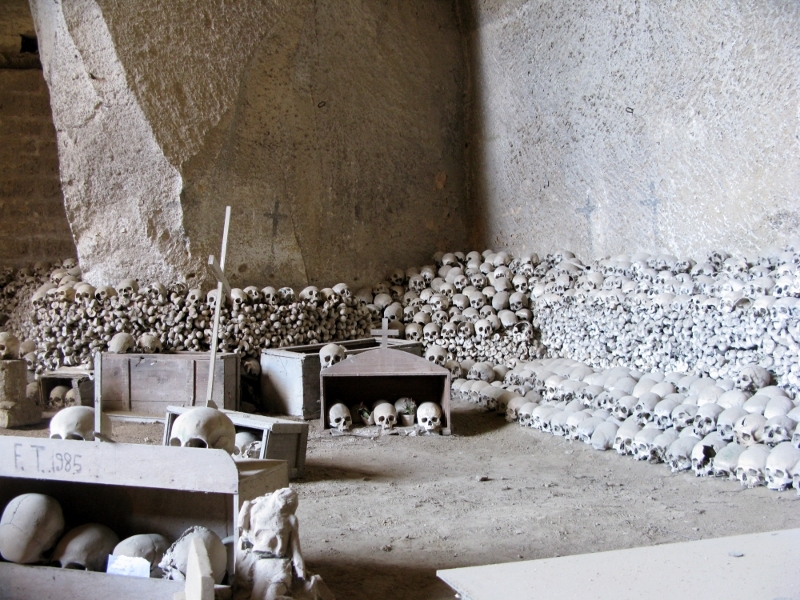 In Fontanelle Cemetery, Naples, a 30 000 square metre cave in the hillside was once home to 8 million of such bones. Today it’s thought that the remains of about 40 000 lie here but for the life of me, I can’t imagine how anyone could count. 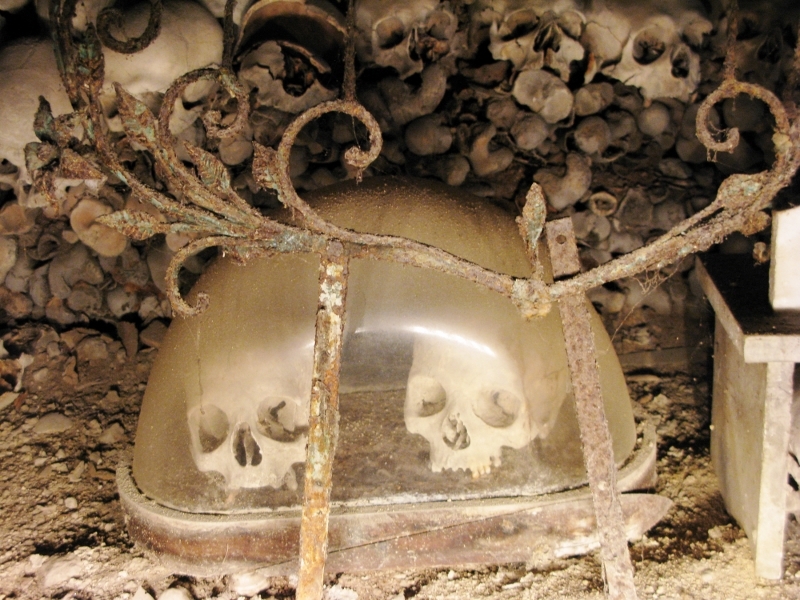 The bones are anonymous – rows and rows of skulls sit atop stacks of femurs and tibia and stare back at you. I fancied I saw holes in some that suggested bullet wounds but it might well have been damage done in transit. 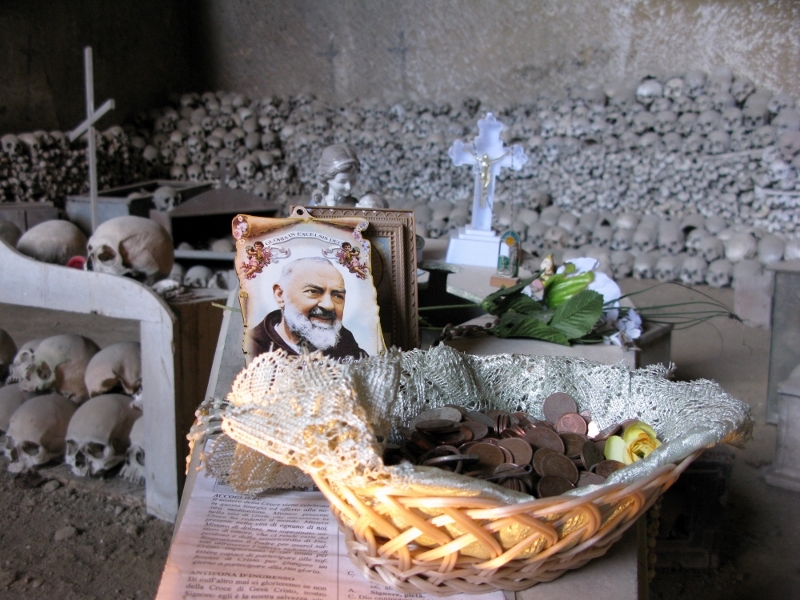 It is one of the strangest places I’ve ever been – and I’ve been to a fair few cemeteries in my time. 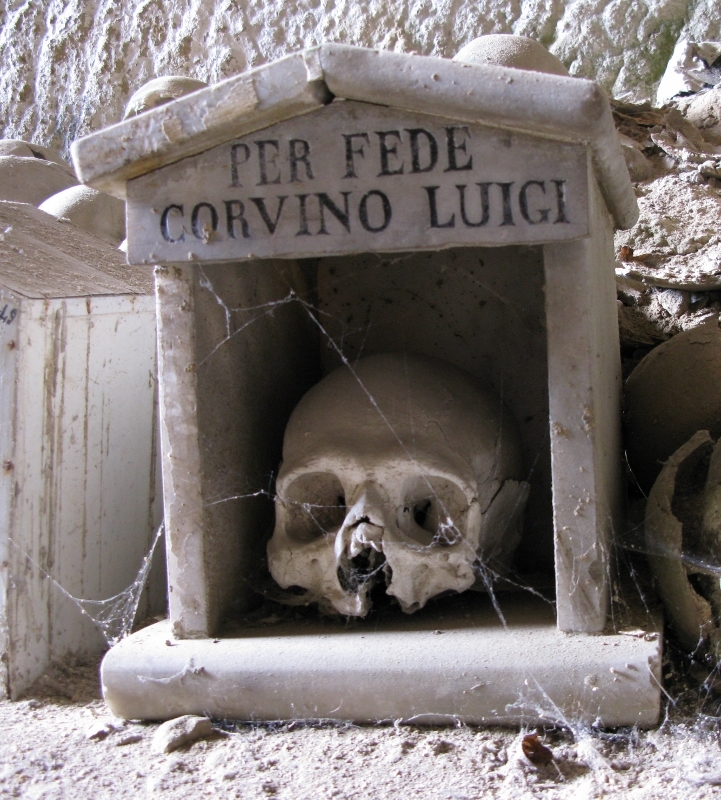 Some have names carved into boxes but these may not match the bones inside. 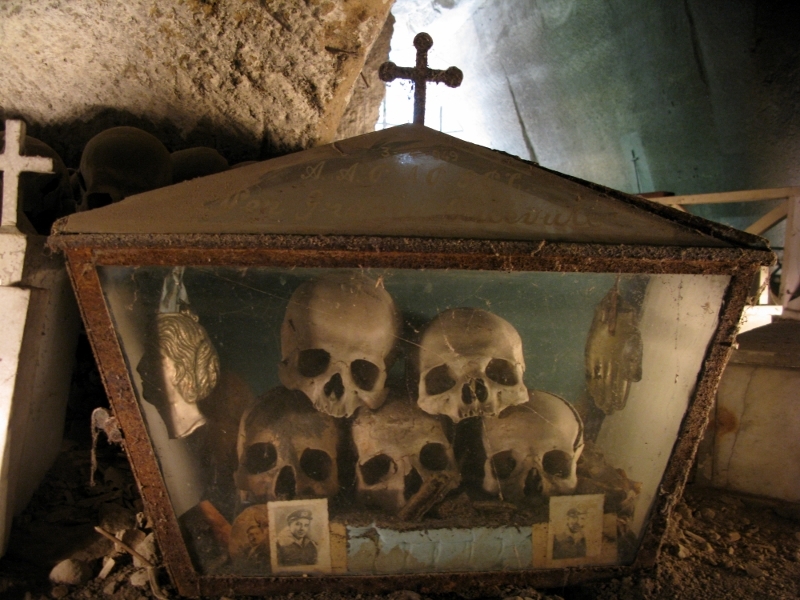 Apparently, a cult took shape in the late 1800s when it was fashionable to adopt a skull and give it a name, a name that was often transmitted to the adopter through a dream. They would come to pray to their skulls and make offerings in the hope of having favours granted. The cult of the anime pezzentelle (abandoned souls) lasted into the late 1960s when the city’s Cardinal Ursi had enough. What might to those involved have seemed like caring for people in death who had no one to look after them in life, was branded a fetish and the cemetery was closed. It was renovated a few years ago and is now open to the public. Back by popular demand …. 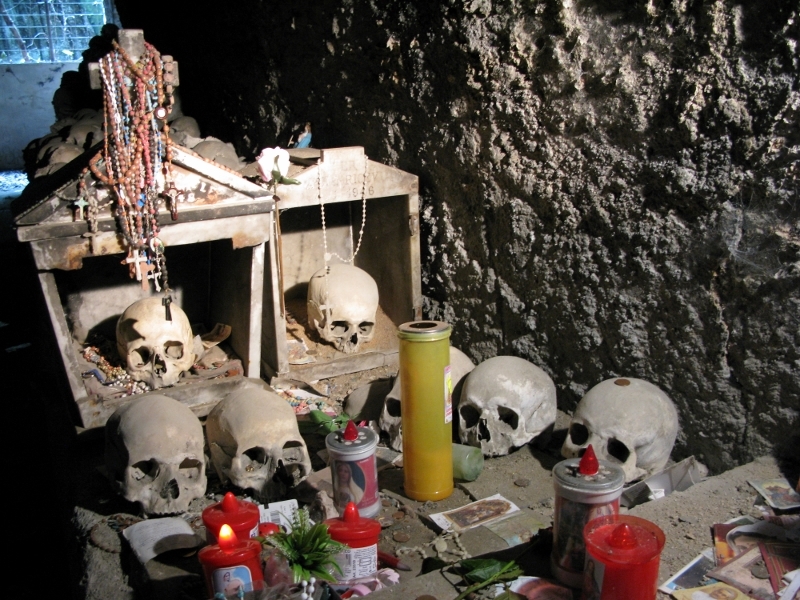 It’s hard to find though, so if you’re in Naples and curious, take Line 1 metro to Materdei. Walk down the hill and around the corner to the left. Half-way along that street there are steps going down even more. Take these to the bottom and turn left. When you get to the small piazza, hang left and the cave is just past the church (worth a visit – a lovely change from the ostentation of the bigger city churches) on your left. Free entry. Open 9-4pm.